The Short Version: This highly accessible, entertaining guide for law enforcement professionals, exploring how to glean the truth when interrogating suspects, will also be of interest to many readers who are not in the law enforcement profession. Despite what we've seen on television, obtaining a confession from a suspect isn't about bravado and heated confrontations in dingy, brightly lit rooms. Gleaning the truth while interviewing suspects, victims, and others involved in an alleged crime is a complex art, honed by years of training and experience. It's tricky. People lie. Some folks are especially good at it. Memories are imperfect reflections of truth, and they are continually reshaped by our feelings and experiences. Being a successful interviewer -- and managing to uncover the truth -- involves myriad skills, as well as empathy, integrity, and awareness. In Detecting Deception, the author coaches readers on these skills and attributes. In addition to asking the right questions, an interviewer has to be mindful of how he* presents himself to a suspect in his demeanor, body language, and communication style. He has to deftly read the suspect's facial expressions and body language as well as subtle nuances in his choice of words. McCormick's discussion of these skills is seamlessly blended with various aspects of human psychology. In addition to antisocial and psychopathic personalities, he explores "fight or flight" responses, Maslow's hierarchy of needs, cognitive dissonance, learning styles, and extroversion vs. introversion. In order to connect with a suspect and learn the truth, it's important to understand what motivates him and how to effectively relate to him. While the author has a wealth of expertise on this subject, he writes in an engaging conversational style, laced with humor, and this book is completely accessible to typical readers. McCormick's keen intelligence and humility, as well as his broad experience, shine through. 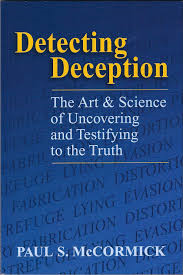 Details from actual criminal cases and personal anecdotes make Detecting Deception particularly interesting and entertaining. I believe this book is a valuable resource for law enforcement professionals, counselors, educators, and anyone else who wants to become more adept at communicating, interviewing, and discerning whether someone is telling the truth. I also think it will be of interest to many people in the general population, especially those who have some interest in crime, law enforcement, or psychology. Writers will find this an especially valuable resource. If you're crafting mysteries or thrillers, you can gain insight into the process of criminal investigations. If you write any kind of fiction, McCormick's exploration of facial expressions and body language can help enrich your character development. The Bottom Line: Despite being packed with information, this was a quick, entertaining read. While fascinating and richly informative, it's written in an accessible conversational style, and the author's personality and sense of humor shine through. Accounts of actual criminal cases and interviews with suspects make it particularly interesting and engaging. *I'm following the old grammatical convention of using "he" in lieu of "he or she." I don't intend to be sexist -- obviously there are many seasoned law enforcement professionals of both genders. As a writer, I simply find the alternative -- "he or she" -- wordy and awkward. About the Author: Paul McCormick is a criminal investigator and licensed polygraph examiner in Augusta County, Virginia. His investigative work focuses largely on sexual and violent crimes. 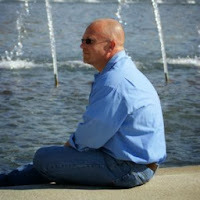 He is a child forensic interviewer, trained in cognitive interviewing, a member of the Crisis Negotiation Team, an active member of the multi-disciplinary sexual abuse task force, and a Master of Instructor for the Blue Ridge Crisis Intervention Team.